Despite public outreach campaigns, a third of all stroke patients don’t call an ambulance to get them to the hospital, leaving them vulnerable to delayed treatment and worse outcomes, according to a new study published in the journal Circulation. The authors analyzed data on more than 204,000 patients, seen at 1,563 U.S. hospitals between 2003 and 2010. Patients who arrived by ambulance were about twice as likely to arrive at a hospital quickly, and were about 50% more likely to receive intravenous TPA – a clot-busting drug – within the recommended three-hour window, when it’s most effective. “Time is brain,” adds Dr. Carolyn Brockington, director of the Stroke Center at St. Luke’s-Roosevelt Hospital in New York. 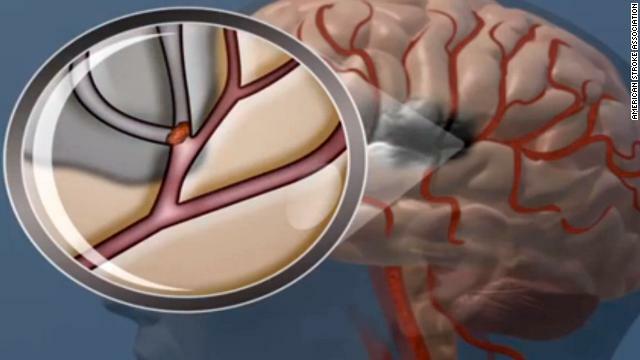 She says about 85% of strokes are caused by a blockage in a blood vessel in the brain, which TPA can help unclog. Younger stroke patients and ethnic minorities are less likely than others to call an ambulance, the study found. Interestingly, the same is true for patients with private insurance, who called emergency services less often than patients on Medicare or Medicaid; they even called less than patients with no insurance. Ekundayo says patients with some insurance plans might be reluctant to call 911, for fear of incurring high out-of-pocket costs. While it’s jarring that many people don’t call for help, awareness actually seems to be improving: previous studies found that only half of stroke patients came to the hospital by ambulance. One challenge, says Rymer, is that many people who suffer a stroke don’t realize what’s happening. “The brain is the affected organ, so you’re not processing things normally.” For this reason, she says, it’s important that people be alert to signs of stroke in friends and family members. – Face Drooping. Does one side of the face droop, or is it numb? – Arm Weakness. If a person tries to raise both arms, does one drift downward? – Speech Difficulty. Is speech slurred, or hard to understand? – Time to call 911. Other symptoms include sudden numbness or weakness in a leg, sudden trouble seeing out of one or both eyes, dizziness, confused behavior and sudden severe headache with no apparent cause. The ASA says you should call 911 even if the symptoms go away before you get to a phone. « Previous entryWould you like 2 hours of exercise with that? I am a fan of both Dr. Gupta and Dr. Cohen, but this is a brain question for Dr.Gupta. My first husband passed away in 1979 and I am told he was the first ever diagnosed with Chromosome 17 Disinhibition Dementia, Parkinsonian, Amyotrophy Complex. It was determined the inheritence rate was 50%. My once brilliant son began to deteriorate in his thirties and we were estranged from his father's family since I divorced him due to frightening behavior. However I did go to see him in Columbia in NYC where he was diagnosed and I was told my son had a 50% inheritance chance. My once brilliant son began to deteriorate in his early thirties and has been hospitalized for the past 12 years. However one research doctor put him out of the research because he did not have tau or progranulin disorders. He was declared well by this one doctor. My son is still hospitalized with a new diagnosis of Incurable Paranoid Schizophrenia and although there were some family members diagnosed as schizophrenics, no research doctor will anwer us because of the findings of this one doctor. However this is still research. The DDPAC site is 17 q-21-22, while there is a schizophrenia site at 17-q-21. I know our President Obama has allocated money for brain research and I want him to know about this. We have essentially been put out of the research on the findings of one doctor and one lab. For myself, I want to know why the best and the brightest on this family spend their lives helping others while the famous worldwide psychopaths only engage in war and destruction for their own gain. Unfortunately, these symptoms are the same exact symptoms I have when I get a migraine. My father and grandmother both had strokes, so I'm hoping there will be a difference in the way the symptoms feel between the migraine and the stroke. Had the exact same symptoms (severe) once from a bad reaction between two medications. Unfortunately alot of things can cause these symptoms. 3 Years ago my mum had a severe stroke, an ambulance was called as she couldn't see and was talking jibberish, unfortunately the inexperienced and uncaring emergency room staff kept her waiting for 3 hours "because she looked ok to them". We had to keep asking for them to help, but thankfully she had taken aspirin that morning. Stroke symptoms can come on quickly and can be undistinguishable from other illness and the person may be completely unaware anything is happening. Both my maternal grandparents had strokes. My grandmother had three severe strokes when I was between 7 and 12 years old. When my mother had a stroke at 47, I knew the signs and called 911 – the paramedics (yes, paramedics) didn't believe it was a stroke and asked me several times if she had been drinking. Seriously??? When my grandmother had her last stroke, we were in the emergency room for hours trying to get a doctor to look at her. Moral of story – learn signs, INSIST on treatment. Most people wait because they can't afford the care. Because of ME!!! I kissed my way up to VP at a health insurance company. Now I take over $600,000 of your health care dollars for NO VALUE ADDED to your health care. And that’s just me. Now think about how many other VPs, Directors, Managers, etc. are at my company alone. Now multiply that by thousands of others at hundreds of other health insurance companies. From 10 to 25% of your health care dollars go towards administration that adds NO VALUE to your health care. But my company’s PAC dollars will continue to fool you little people into thinking that a single payer system will be bad. Little people like you are so easy to fool. Little people also don’t realize that a single payer system is the ONLY system that would allow little people (as an entire country) to negotiate better health care prices. Little people don’t realize that the Medical Cartels already know that. And that is the reason why the Medical Cartels spend so much PAC money from the hospitals and doctors lobbying against a single payer system. Some little people say that a single payer system would cost you little people more. But if that were true, then wouldn’t the hospitals and doctors WANT that extra money? Yes they would. So why do the Medical Cartels lobby against a single payer system? It’s because the Medical Cartels know it would allow little people to negotiate better health care prices. And that’s what the Medical Cartels are afraid of. Period. I want to use this medium to share of the Goodness of God in helping me recover of Stroke. In 2002 November 8 I had my first Stroke, After returning from my friends house, immediately I was rushed to the Community health Care. The neurologist said that I had been having "mini-strokes" or "Trans Ischemic Attacks (TIA's)" for years. All the physicians agreed that a congenital heart problem called Atrial Septa Defect was causing the strokes. After the first major stroke, however, I was not well enough to undergo the corrective heart surgery. First, I would have to build strength and endurance through physical therapy, The right-sided strokes had rendered the left side of my body numb to the touch, heavy, and extremely uncoordinated. Peripheral vision was permanently damaged. It was difficult to stay awake, least of all alert. The brain stem swelling caused imbalance, dizziness, and at times a slowing of respiration. Stroke affected vital pathways in my brain, causing constant electric-like pain on the left side of my body. After the second stroke,I was placed on machines aided life support and the doctors tried all they could but I wasn't recovering they decided i give a traditional herbal doctor a try, since all they have done to revive me was to no avail. My Children took me back home and reach out to my friends and family for help. luckily for them A college friend of mine had a uncle who was a traditional herbal doctor; "Dr kpomosa" he base in Indianapolis IN and has helped so many people all over the world with his herbal formula ; so they said. My Children were reluctant to give his herbal formula for stroke a try, they needed me to get well by any means necessary because there mum died of Cancer years Ago. They were willing to go any Length for a cure. Well to God be the Glory Dr kpomosa was a God sent, he placed me on his medication, although he wasn't present, but with his instructions my children where able to administer his medication that was sent via Transworld express delivery. His medication was a huge miracle, it was like he had my brain refreshed, my brain began to have control over my body system,3 months after completing dr kpomosa herbal formula, I regained the ability to walk, speak clearly and drive very well. To God alone I give all the glory and am for ever greatful to Dr kpomosa for being a hand of God in my Life. I want people to think back to Natural herbs, that's why am sharing this.i believe God has hidden the solutions to all sickness and diseases in Natural herbs and root that we don't pay much attention to. Am a living testimony of Natural herbs and root. If you or a loved one is going through a deadly diseases that seems impossible to cure totally, believe me root and herbs is the Solution. You can reach Dr kpomosa on his Facebook page "Dr kpomosa home of relief" or , for all in need of a permanent cure to stroke or any other Chronic disease like Cancer that took my beloved wife. Dr kpomosa is hope for all. Like Dr Kpomosa would say 'to every problem there is a solution".